used since the active ingredient is in the green outer hull. Black walnut hulls may look and smell like small limes. enamel, or Teflon) pots or bowls. fill the pot to the top. Put them in the pot and cover completely with the alcohol or vodka. Sprinkle on 1 tsp. vitamin C. Cover with lid. Let set for three days. 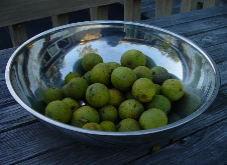 Discard walnuts (squirrels love them!). unopened, even if it darkens slightly. Exposure to air causes the tincture to darken and lose potency very quickly. one large one in order to reduce repeated exposure to the air once opened. Store bottles in freezer for maximum potency. wood alcohol or isopropyl alcohol contamination. any supplements before starting or changing your current protocol. permission. Web page updated July 13, 2009.